Beat the eggs, milk, water and lemon juice or vinegar together. Add the egg mixture to the dry ingredients and mix well. Use a non-stick or slightly greased frying pan. Bake pancakes one at a time and stack. Set aside. Prepare the filling and topping ingredients. 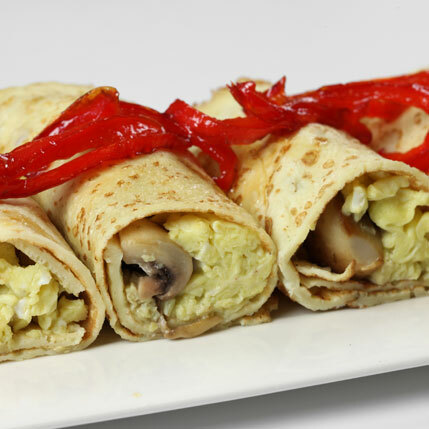 Fill individual pancakes with scrambled egg and mushroom filling. Roll up and cut each roll in half. Place rolls alongside each other on a heated serving platter and scatter roasted red pepper strips over for garnishing. The filled pancakes is a good choice for a late breakfast or brunch.